Campylobacter is an illness caused by bacteria of the same name (it’s also sometimes called campylobateriosis). The bacteria is found in most of the poultry we eat, as it exists in birds and doesn’t make them sick. More serious illness may require the use of an antibiotic to clear up, and in some cases people develop arthritis or a very rare nerve disease called Guillain-BarrÃ© syndrome after having campylobacter. This disorder causes the body’s immune system to attack the nerves, resulting in paralysis. Campylobacter is almost always isolated to an individual or small group that ate undercooked poultry, but more widespread outbreaks are possible, usually associated with unpasturized milk or tainted drinking water. These bacteria live in the guts of ruminant animals, most notably cattle, but also deer, elk, goats and sheep. In the slaughtering process the intestines can be cut, allowing the bacteria onto the meat. E. coli usually doesn’t make the host animal sick, but when humans ingest it they’re often in for diarrhea, which can be bloody, stomach cramps, vomiting and sometimes a low fever. Food science nerd Harold McGee reports that about a third of all people who develop E. coli illness need to be hospitalized, and about 5 percent of those die. It’s most dangerous in children. About 5 to 10 percent of those who get infected with E. coli will develop a more serious illness, hemolytic uremic syndrome, which can lead to kidney failure. The most common culprit for E. coli contamination is ground beef, as grinding meat from many different cows together spreads the bacteria across a wider range of packages. It can also be found in unpasturized milk or apple cider, or cheeses made from raw milk. If you’ve ever been pregnant you’ve probably heard about the dangers of listeriosis, or infection with the bacteria Listeria monocytogenes. Listeria is found in soil and water and especially in places that have been fertilized with manure. The bacteria is carried by animals it doesn’t harm, and it can contaminate animal products including meat, milk and cheese, as well as vegetables that come into contact with the bacteria. Infections can be caused by uncooked meats, raw-milk cheeses, vegetables and cold cuts or soft cheeses that may be contaminated at the deli counter after processing. Pasteurization and cooking kill listeria, but products can be contaminated after cooking and before packaging or through cross-contamination at the deli. Fever, muscle aches, nausea or diarrhea are the most common symptoms, but the infection can spread to the nervous system, causing headaches, a stiff neck and convulsions. About 2,500 people become seriously ill in the United States each year from listeria and about 500 die. Mad cow, properly known as bovine spongiform encephalopathy, is a chronic, degenerative disease affecting the nervous systems of cattle. Consumption of infected cattle has been linked to a disease known as variant Creutzfeldt-Jakob Disease in humans, which is always fatal. While it’s not completely clear how BSE in cattle is connected to vCJD in humans, it’s thought that the disease is passed by eating meat that contains brain tissue. The parts of the cow considered to be most infectious for humans are the brain, spinal cord, retina, optic nerve, and dorsal root and trigeminal ganglia. McGee reports it may also be found in muscles, which means many different cuts of meat may be potentially dangerous. The disease was spread among cattle when they were given feed containing these parts from sick cows, a practice that has since been stopped. The illness has killed more than 160 people in Britain and nearly 40 elsewhere in the world, but since the illness has an incubation period of a year or more, it’s likely there are more cases that have yet to surface. The infectious agent is known as a prion, a kind of protein that carries the disease between cows or from cow to human. If meat you eat has these prions, there’s nothing you can do about it; cooking will not affect it. Symptoms of vCJD include dementia, memory loss, hallucinations and personality changes paired with physical changes such as jerky movements, slurred speech, difficulty walking or changes in posture or gait and seizures. Death from this disease can happen in a matter of weeks or months, but some people manage to live for years with the disease. One of the most famous and common of the foodborne illnesses, salmonella is a bacteria that lives in the intestinal tracts of animals. When feces comes in contact with food that isn’t cooked, the bacteria can be transmitted to humans. About 40,000 cases of salmonella are reported each year, but since many people don’t seek treatment it’s thought the number of people who get it might be 30 or more times larger than the number of reported cases. Salmonella sometimes leads to Reiter’s syndrome, a condition of painful joints, eye irritation and painful urination that can last for months or years and may in turn lead to chronic arthritis, but this is pretty rare. Staphylococcus aureus, more commonly known as staph, is a common cause of food poisoning. Staph can linger in foods such as meat, poultry, eggs, dairy products, meat, egg, pasta and potato salads, sandwich fillings and filled baked goods like eclairs and cream pies. Staph can grow even in the refrigerator, and infested food won’t have an off odor to let you know you shouldn’t eat it. People who eat food that has staph in it usually get sick very quickly and will usually have nausea, vomiting and abdominal cramping. In more severe cases people may have headaches, muscle cramps and changes in blood pressure. Trichinosis, also called trichinellosis, is an infection caused by eating animals infected with the larvae of a worm called trichinella. It can be contracted by eating wild carnivorous animals or domesticated pigs. This infection is pretty gross to describe. When you eat tainted meat, the larvae or cysts of the worms are ingested, and your stomach acid dissolves the cyst, releasing the worm, which matures in a couple of days in your small intestine. The worms mate in there and the females lay eggs, which then develop into immature worms, travel through the arteries into the muscles and there form cysts again. 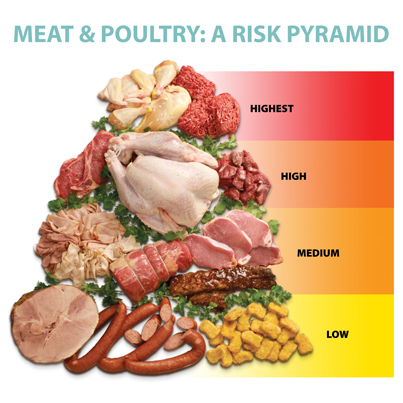 You might get a stomachache, nausea, diarrhea, vomiting, fatigue or fever in one or two days after eating tainted meat, and two to eight weeks later you may have further symptoms such as headaches, fever and chills, coughing, eye swelling, muscle or joint pain, itchy skin, constipation or diarrhea. Many mild cases go undiagnosed and go away on their own, but if you have a severe case it can be treated with drugs. Just to name a few, there are many more…. The processed “junk” meat foods post lower risks in food borne illnesses but higher in other health issues. A vegan diet offers an incredibly effective way to protect animals, the environment, and your health. If you don’t want your food dollar to support animal slaughter, a vegan diet is really the only way to go. That’s because there are no retirement homes for dairy cows and egg-laying hens. They all go to slaughter, typically before they’ve reached even half their natural life expectancy. Apart from animal slaughter, there are intractable ethical problems associated with dairy products and eggs. One of the key objections to the dairy industry is that, in order to maximize milk yields, dairy cows are typically kept pregnant nine months out of every year. And as a result, the dairy industry is awash with unwanted calves. And since male dairy calves are obviously unable to produce milk, and aren’t the correct breed to be raised as beef, they are generally raised for veal or slaughtered at birth. The male counterparts of egg-laying hens don’t fare any better; most of these animals are eithersmothered or ground up alive immediately after hatching. In the United States alone, about 200 million male chicks are discarded in this manner each year. Leaving aside the fact that nearly all dairy cows and layer hens go to slaughter, these animals are often subjected to even greater cruelties than those who are bred for meat. You can become acquainted with the ethical problems of the dairy and egg industries by watching the short video Farm to Fridge or by reading books like Jonathan Safran Foer’s Eating Animals or Mark Hawthorne’s Bleating Hearts. From an environmental point of view, a vegan diet likewise makes enormous sense. There’s no doubt that raising crops directly for food requires fewer resources, and generates less waste, than feeding crops to animals. What’s more, scientists are unanimous that the methane production associated with livestock is one of the key factors in global warming—quite possibly exceeding the impact of all greenhouse gases generated by cars, airplanes, trains, and ships. The health advantages of a vegan diet aren’t as pronounced as many animal advocates contend, and it’s certainly possible to eat an extremely healthful diet that contains some animal products. That said, a vegan diet will automatically eliminate many of the the most unhealthful foods that people regularly eat: hamburgers, hot dogs, sausages, fried chicken, ice cream, and so forth. When you replace these foods with more healthful vegan choices, it’s likely that you’ll feel better while simultaneously reducing your risk of cardiovascular disease and certain types of cancer. Going vegan is easy, especially if you read up on how it’s done. Check out Erik Marcus’ Ultimate Vegan Guide as well as our page on becoming vegan. Mylan Engel, a philosophy professor from Northern Illinois University, spoke to the EIU Philosphy Club in the Lecture Hall of the Doudna Fine Arts Center on Thursday. Engel’s talk, “Fishy Reasoning and the Ethics of Eating,” centered around the effects of raising animals for human consumption. What Mylan Engel remembers most about his grandfather’s hog farm is when he was about 8 years old and he first saw piglets being castrated. 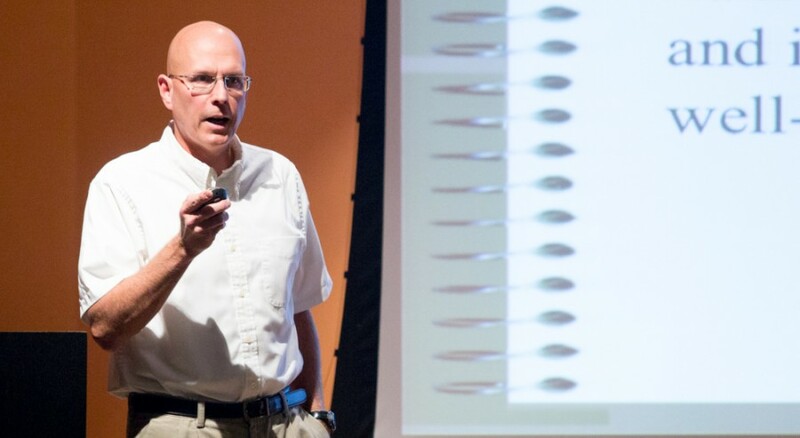 Engel, a philosophy professor at Northern Illinois University, presented his reasons for following a vegan diet based on ethical principles and health reasons Thursday in the Doudna Fine Arts Center Lecture Hall. He said in situations where no other resources are available, killing animals for food is acceptable, but in most situations, plant-based diets are viable options. However, Engel did not always follow these guidelines; he himself was a hunter until the age of 20. While in graduate school in 1984, Engel participated in competitive long distance running with a friend who was vegetarian. He said he became convinced he could meet all his nutritional needs with a vegetarian diet when he realized his friend was the fittest person he had ever met. “This guy could run circles around me, so I switched to a vegetarian diet,” Engel said. Engel did not become vegan until 1996 when he attended the World Congress for Animals in Washington, D.C. and met animal rights leaders. “Listening to them talk and seeing how healthy and vibrant all these vegans were around me, I realized that the only way I could be consistent with my own values was to give it all up,” Engel said. Engel defended his premises by citing data that suggested humans’ nutritional needs could be met with a plant-based diet. According to his presentation, the American Dietetic Association and the Dieticians of Canada share the position that vegetarian diets are healthful, nutritionally adequate and can prevent and treat certain diseases, and well-planned vegan and vegetarian diets are appropriate for all ages. One audience member asked about individual sustainable farming, citing that there were simple, efficient ways to kill animals that are quick and relatively painless. Engel responded that killing animals when other options are available is still wrong because it is depriving the animal of half or more of its life. “If in the middle of the night tonight when you’re sound asleep, I slit your throat and kill you painlessly, would I have harmed you?” Engel asked. Engel also pointed out that vegan diets offer plenty of variety, contrary to what some might think. Another audience member asked why eating eggs or milk was ethically wrong if those products were not sentient beings. Engel said 900 million male chicks are grinded alive each year because they are considered byproducts of egg production, and similarly, bull calves are sold for veal and calves in general are taken from their mothers, causing them to grieve. Another point of his lecture was that eating fish is unethical as well because studies indicate their intelligence and ability to feel pain, whether they are crushed by the weight of other fish in giant nets, suffocated on the surface, destroyed by the rapid changes in pressure, or kept in bad conditions on fish farms. Meat production requires 10 to 20 times more energy per edible tonne than grain production and has as high as a 54:1 protein inefficiency ratio (units of plant protein required to produce a single unit of meat protein) . Each cow raised requires (directly and indirectly) 90 to 180 litres of water a day and passes 40kg of manure per kg of edible animal tissue. A study by the National Institute of Livestock and Grassland Science in Japan estimated that 1kg (2.2 pounds) of beef is responsible for the equivalent amount of carbon dioxide emitted by the average European car every 250 kilometers, and burns enough energy to light a 100-watt bulb for nearly 20 days . Protein rich beans require only fertilization, water and land, with very little maintenance. Once grown, there’s a long list of energy expensive processes required to turn animals into legally consumable food; from transporting them to the abottoir, slaughtering them, cutting them into pieces, sanitizing and packaging the pieces (usually in plastic) and then delivering the result to shops where they are refrigerated until sale. Refrigeration alone is extremely energy expensive. Suffice to say very few people would be able to eat animals today were it not for this sprawling, around-the-clock, energy infrastructure. The process required to turn beans, grains and nuts into pantry-apt food is minimal and has an extremely long shelf life, no need for energy expensive refrigeration. ‘Livestock production’ uses more than 30% of the earth’s entire arable land surface, with beef ranches driving 60-70% of Amazon deforestation today[5a][5b]. Conservative forecasts assume that over half of all arable land on earth will be dedicated to the production of cow parts, cow milk, chicken and pig parts by 2050. Soya has 4 times more calories than red meat so the amount of soy that could be grown using the same amount of land would feed far more people than if used to raise cows. More so, a diet based around animal tissue requires 7 times more land on average than a plant-based diet yet (somewhat ironically) much of the meat eaten world-wide is raised on soya grain. 94% of all soy grown in America, for instance, is fed to livestock rather than people directly. Only 2% of all soy grown in the U.S. is eaten by people with soy based fuels consuming the remaining 4%) . This makes American meat eaters the primary drivers of soy bean monocrops in that country. The trick here is to eat the bean before it gets to the cow. The more cows, pigs and chicken eaten, the more competition there is for wooded land. The more demand for animal parts, the more monocrops there are, significantly threatening the biodiversity upon which we all depend. Agriculture has negative secondary effects. The Earth is increasingly saturated in animal waste, far more than it can readily process. Animal waste from agriculture accounts for 50-85% of all ammonia found on land and in water, contributing significantly to acid rain and air pollution worldwide . Hard to believe, given that we were all told the ocean is apparently abundant and endless, but it’s true: 40% of the worlds oceans are considered by experts to be detrimentally affected by fishing. According to an FAO estimate, over 70% of the world’s fish species are either exploited to unsustainable limits or depleted. Species such as the Blue Fin Tuna are now endangered alongside 69 other species of fish in abundance just decades ago . It is safe to say many of the fish species eaten by children today will be facing extinction by the time those children become adults. The global harvest for fish has more than quadrupled since 1950, from 22 million tonnes to 100 million tonnes over the same period. The environmental cost is already unimaginable, along with a real threat for consumers’ health from the unnatural conditions of inland fish farms. A detailed account of both kinds of production can be found here and here. If you like the ocean it’s a good idea to stop funding the industries that harm it. It appears too late to hope that regulation and reform will drive a shift to less destructive methods, let alone waiting hundreds of years for coral reefs and underwater ecosystems to heal. You can help slow the decay by not eating fish. If this seems unimaginable then learn to catch fish, one at a time, with a hook and rod. This has a significantly lower environmental impact than any other modern means of catching fish. Legumes, especially soybeans, contain the largest percentage of protein among the vegetable foods and are in the same range as many meats. If legumes are a central part of a person’s diet, there will be plenty of enough protein in the diet with no need for animal-tissue. For example, one cup of cooked soybeans contains approximately 20 grams of protein; that is equivalent to three hot dogs, a quarter-pound hamburger, three 8-ounce cups of milk, three ounces of cheese. On the other hand, industrially produced meat and fish is famously full of nasty things, from bleaching agents to antibiotics, responsible for allergies, resistance to medicines, fatigue, dehydration and a long list of cancers. Seehere and here. ‘Food animals’ consume 80% of all antibiotics produced in America [10a][10b][10c] and at least 45% in the European Union in order to combat the illnesses they get when fed grains (cows and pigs didn’t evolve to eat corn and beans) and those from intensive farming. Antiobiotics fed to animals are almost always in the same medical group as that of those fed to humans, and so when bacteria develops a resistance to antiobiotics on a farm it cannot be fought when encountered in people. This is the history of most epidemcis (like E-Coli) threatening modern human life. Antiobiotics from animal parts also end up in the bodies of those that consume them, alongside doses of hormones known to have significantly detrimental impact on people, especially children . The hormone Oestradiol 17ß, used widely by major exporters of cow pieces, is considered a complete carcinogen. It exerts both tumour initiating and tumour promoting effects. The eating of meat affects other people, contributing significantly to food shortages worldwide. In the U.S., animals are fed more than 80 percent of the corn and 95 percent of the oats grown. The world’s cattle alone consume a quantity of food once estimated (Gold and Porrit) to be equal to the caloric needs of 8.7 billion people, more than the entire human population on Earth. Instead, a vast proportion of the world’s forests have been felled to grow the grains fed to cattle. A report from the United Nations Framework Convention on Climate Change considers agriculture to be the single most prevalent cause of deforestation throughout human history , depleting world oxygen supply, threatening and/or extinguishing animal and insect life, tipping surrounding ecosystems and devastating indigenous communities and their cultures. Consider also the impact on supplies of freshwater. To produce 1kg of feedlot beef requires 7kg of feed grain, which takes around 7000 litres of water throughput to grow. The demand for water to grow food to feed cows is resulting in vast areas of arid, dying land throughout the world as water is pumped out to feedlot farms elsewhere. Data adapted from here. While the increasing demand for ‘organic’ meat in 1st world countries has a less negative impact on the soil itself, cows still require water and cleared land on which to graze. More so, as organic meat cannot be grown as quickly as hormone engineered meat these animals consume more land and require a larger amount of plant matter over the course of a lifetime. The Agriculture industry is full of many clever and well researched people, all looking to profit where possible: there would be more grass fed cows if it was as or more efficient than industrial methods. Replacing industrialised meat with grass-fed alternatives would rely on vastly greater rates of deforestation than currently experienced while prohibitively raising the cost of animal parts themselves (see Author’s note, below). ‘Organic meat’ is thus not a drop-in solution at the current rates of meat consumption. It is safe to say meat is no longer an environmentally or socially responsible source of protein at today’s population levels. It was ‘sustainable’ once, but not at all now. If you are a person that believes it’s not possible to live without eating meat you may consider exploring a more immediate relationship with your choice of diet, with the origin of what you choose to put into your body. Rather than paying someone to kill on your behalf, find a local farmer and arrange to learn to kill the animal you select for eating, preparing the parts for transportation once done; the parts you freeze will last you a very long time. Julian, one of the authors of this document, grew up on a small farm and attests to the awakening importance of taking direct responsibility for the choice to eat meat; selecting an animal, holding it down as it struggles, and then taking its life with a blade. This is a perspective those that wish to sell you animal parts (and the large agricultural corporations they work for) would dearly rather you do not have. According to a 2006 report by the Livestock, Environment And Development Initiative, the livestock industry is one of the largest contributors to environmental degradation worldwide, and modern practices of raising animals for food contributes on a “massive scale” to air and water pollution, land degradation, climate change, and loss of biodiversity. The initiative concluded that “the livestock sector emerges as one of the top two or three most significant contributors to the most serious environmental problems, at every scale from local to global.” In 2006 FAO estimated that meat industry contributes 18% of all emissions of greenhouse gasses. This figure was revised in 2009 by two World Bank scientists and estimated at 51% minimum. 18 percent of greenhouse gas emissions come from livestock (more than from transportation). 60-70 percent of previously forested land in the Amazon now hosts cattle. Two-thirds (64 percent) of anthropogenic ammonia emissions, which contribute significantly to acid rain and acidification of ecosystems, come from cattle. The livestock sector accounts for over 8 percent of global human water use, while 64 percent of the world’s population will live in water-stressed areas by 2025. The world’s largest source of water pollution is believed to be the livestock sector. In the United States, livestock are responsible for a third of the loads of nitrogen and phosphorus into freshwater resources. Livestock account for about 20 percent of the total terrestrial animal biomass, and the 30 percent of the earth’s land surface that they now pre-empt was once habitat for wildlife, in an era of unprecedented threats to biodiversity. These problems will only get worse as meat production is expected to double by 2050. 2. Williams, Erin E. and DeMello, Margo. Why Animals Matter. Prometheus Books, 2007, p. 73. 4. New York Times analysis. 5. Livestock’s Long Shadow, UN Food and Agricultural Organisation, 2006. 6. U.S. could feed 800 million people with grain that livestockNews.cornell.edu. 1997-08-07. Retrieved 2010-05-01. 9. Meat and Health, UN Food and Agricultural Organisation. 10a. Farm Animals Get 80 Percent of Antibiotics Sold in U.S.
11. Meat hygiene 10th edition, Von J. F. Gracey, D. S. Collins, Robert J. Huey, Harcourt Brace and Company, 1999. 12. Barnard ND, Nicholson A, Howard JL. The medical costs attributable to meat consumption. Prev Med. 1995;24:646-655. 13. UNFCCC (2007). “Investment and financial flows to address climate change”. unfccc.int. UNFCCC. p. 81. 15. Ammonia Emissions and Animal Agriculture, Virginia Tech. N/A. A favourite meat-free recipes blog. Here’s another and another. This page was written by Marta Peirano and Julian Oliver.